Begun in 1940, the White and Red Ball has become one of the major social events of Chicago’s Polish community. 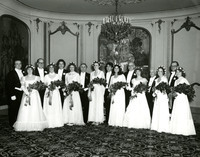 The iconic Presentation of Debutantes was added to the ball in 1945. 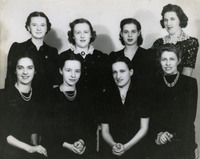 To this day, being presented as a debutante at the Legion’s ball is considered a rite of passage for young Polish women in Chicago and beyond. Aside from being an elegant event for the community, the White and Red Ball has remained the single largest fundraiser held by the Legion each year. If not for the money raised at this event, the Legion would be unable to continue in its philanthropic endeavors. Though undated, this photograph accurately represents the grandeur and spectacle associated with the White & Red Ball. 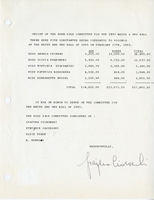 Click the image to view it in greater detail. An event of this magnitude requires considerable work. Nearly 20 committees associated with the ball allow dozens of women to acquire invaluable leadership experience each year. Publicity notices for the ball go out to all the major English and Polish newspapers in Chicago. Click here to read this Chicago Tribune article from 1956. 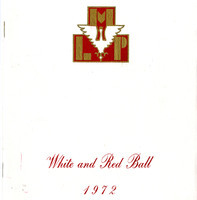 Click here to explore the White & Red Ball Program from 1972. You'll find a history of the Legion, the program, dinner menu, photos of debutantes, and much more. The White and Red Ball traditionally begins with the stately Polonaise and ends early in the morning with the lively Biały Mazur. Click to view the full event details. 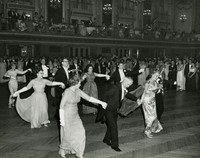 The Polonaise, which traditionally opens formal occasions in Polish society, is danced by past Legion presidents and board members to open each ball. 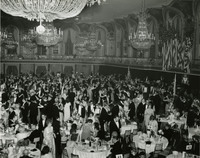 Hundreds of people attend the White and Red Ball held in 1970. Think you’d like to be a debutante? Click here to read the debutante guidelines from 1991 to see if you have what it takes. Debutantes are formally presented at the ball by their fathers or, if unavailable, another older male relative. Here, the debutantes of 1980 are pictured with their presenters. The Queen of the Ball is chosen based on the money each debutante raises by selling advertisements for the program and roses during the ball. Click here to read the full report. When the totals have been tallied, the debutante who raised the most money is crowned queen by the queen of the ball from the year before. The post debutantes, dressed in red, dance the Biały Mazur to close each White and Red Ball.